Do you have the training you need to respond under fire? The truth is that most people do not. Unless you train under Adrenalized circumstances, in realistic scenarios, with an actual threat, the likelihood of responding properly and accurately to a stressful situation are minimal. 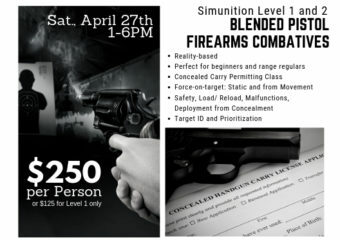 This is the reason that KSA Martial Academy and ASSERT Professionals are bringing you Non-Lethal, Scenario-based Firearms Training with Simunition FX dedicated training weapons and ammunition, the leaders in non-lethal firearms training. Created by Sigung Paul Vunak, the RAT was designed as the hand-to-hand combat method used by the Navy SEALs. It is now in use by numerous other agencies and has been recently approved for Civilian use.